I got to cheer on one of my very best friends from afar while she did her first IM in Arizona. She did awesome finishing in 11:00:03 (her goal was 11 hours so I'd say she nailed it pretty good). Kari and I made her a video and lots of posters since we couldn't be there to cheer her on in person. Kari and I wrote the script and acted in it, Marty filmed, directed and edited, and Jimmy and Bobby also made appearances. I'll just say it - we are hilarious. 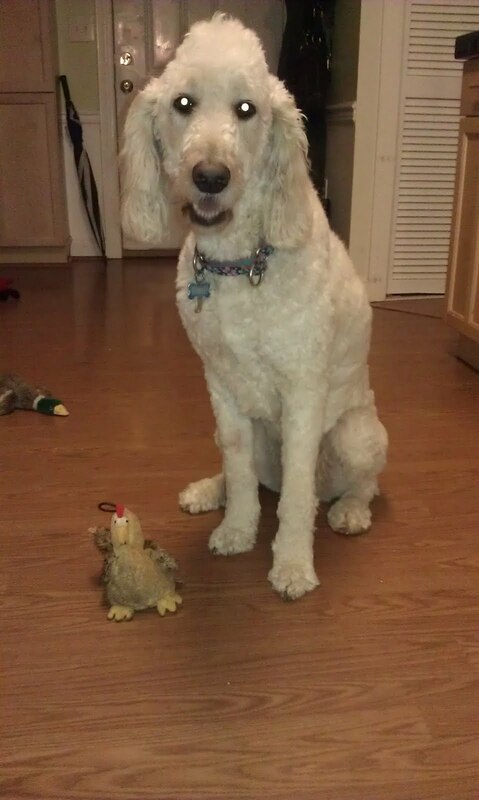 Tassie says, "Happy Turkey Day!" She has lots of toys that she pretty much equally plays with (so that makes them spread all over our house). You may notice 2 other toys in this picture, all ingeniously named. Of course, there's 'turkey', then 'ducky' not too far behind her, and finally a bit of 'santa' in the far back. Here's a Tassie story from this morning. Marty got up early (story of his life) to go coach Master's and Tassie was up with him. When I get up on days like this, she is usually right outside the door waiting for me. Not today. She was laid up in Logan's room and when I walked in there she didn't even lift her head. She did open her eyes and then very lazily lifted her leg so I could come over and scratch her belly. Spoiled dog. Feeling him move around and kick. I thought this was going to be super weird and it was at the beginning but now it's just so neat and I know I'm going to miss it. At this point he doesn't have as much room so when he moves you can see his foot (or heel, or whatever) poking out of my stomach. Having thick hair. Okay, it's technically not thicker, but when you're pregnant your hair doesn't shed as much (or really at all). I have very fine hair and not a whole lot of it so this has been awesome. What's not going to be awesome is when it does shed after his birth (which it will). Then I'll be bald and overweight...not going to be a good look, that's for sure.